As the weather turns colder here in London, I find myself often craving a bowl of hot soup. So this weekend, I decided to make a simple noodle soup for dinner. The dish I chose was a variation on laksa, which is a popular spicy noodle soup from Peranakan culture. 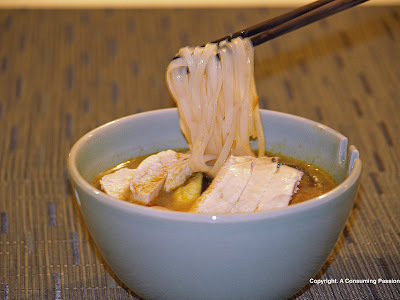 I find traditional laksa to be somewhat heavy as it is usually made with coconut milk. 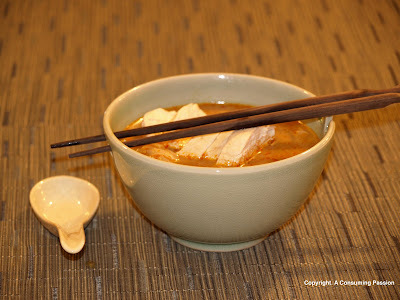 The version I chose to make, courtesy of Bill Granger, is much lighter given that it substitutes the majority of the coconut milk with chicken stock instead. While I added chicken and eggplant to my laksa, feel free to mix it up and use things like shrimp or bok choy instead. Cut the eggplant into thin (5mm) slices and place under a grill for 7-8 minutes. Take out to cool. Heat the peanut oil in a large saucepan over medium heat. Add the curry paste and cook, stirring, for 1-2 minutes, or until fragrant. Add the stock, coconut milk, kaffir lime leaves and ginger. Increase the heat to high and bring to the boil. Then reduce the heat to very low, add the chicken, cover the pan and poach the chicken gently for 7 minutes, or until just cooked through. Remove the chicken and set aside to cool slightly, then shred. Season the soup with the brown sugar and lime juice, to taste. Divide the rice noodles, shredded chicken, eggplant and bean sprouts among four large bowls. Pour in the hot soup and garnish with thinly sliced kaffir lime leaves. This looks very good. I've never had laska before, but I'm sure I'd enjoy it!